Unknown10:24 AM 0 sweets for free! I can't wait to get my hands on one! iPhone 6 available at P1,799 per month, iPhone 6 Plus at P2,049 per month. Smart just announced the pricing details of iPhone 6 and iPhone 6 Plus for postpaid subscribers as it officially opens its pre-order page for those who want to claim their new phones beginning November 14, 2014. Starting November 7, those who want to get their hands on Apple's latest smartphone devices can go to the pre-order page smart.com.ph/iPhone. Both iPhone offers come with FREE all-net texts, all-net calls plus consumable data every month which can be used for video and music streaming, file uploads, and downloads, and chatting. Existing subscribers who want to upgrade to the new iPhones can do so with the help of Smart’s Wipeout promo, which allows them to “wipe out” their existing contracts as long as they have less than 20 months left on their contracts. Corresponding discounts on the wipeout fee will be applied depending on the number of remaining months in the contract. Additionally, every subscriber that avails of the wipeout promo can get FREE 1-year handset insurance on their new iPhones for repair and replacement of the units in case of accidental damage or loss. For more information, visit smart.com.ph/wipeout. For interested subscribers who want to check out or claim their new iPhones from November 14 to 16, Smart will take care of their ride to and from selected Smart Stores absolutely FREE! They only need to download the Uber app on their phones, book a ride, and enter the SMARTIPHONE6 promo code to get the ride without any cost. Upon arriving at the store, a special lane will be dedicated for them so they can immediately get and enjoy their devices on that day. Additionally, for a limited time period since launch, postpaid subscribers who got a new iPhone will be able to choose their own mobile number, if available. This offer is available on a first-come, first-served basis, and can be enjoyed when you sign up at any Smart Store nationwide. As an added treat, each user who subscribes to any iPhone 6 or iPhone 6 Plus from Smart will immediately get three FREE movies they can watch through Blink, a new and innovative mobile app that lets them watch Hollywood blockbusters and TV shows on their mobile phones. Subscribers can also buy more movies by texting BLINK 60 (catalog movies), BLINK 99 (latest movies) or BLINK 250 (unlimited TV series) to 3161. To enjoy these exciting video content, users only need to download the BLINK app from the App Store. Postpaid plans are subject to 24-month contract. 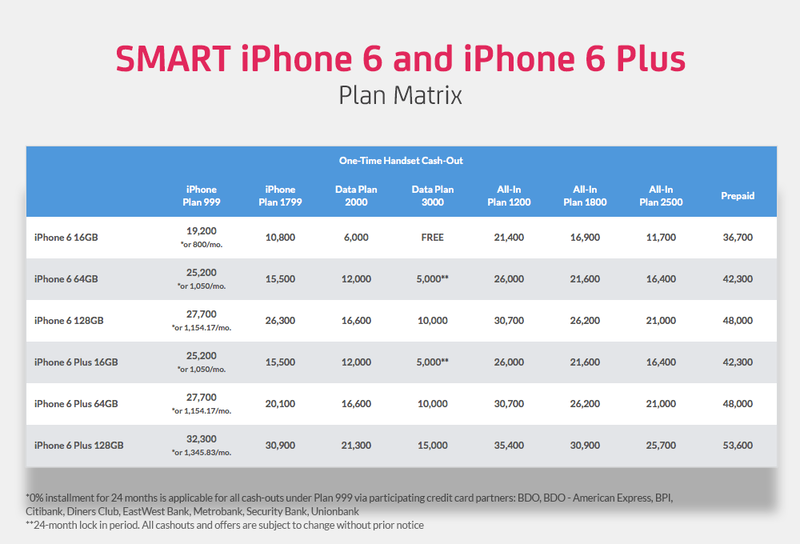 iPhone 6 and 6 Plus are also available under Smart All-in Plans 500, 800, 1200, 1800 and 2500. 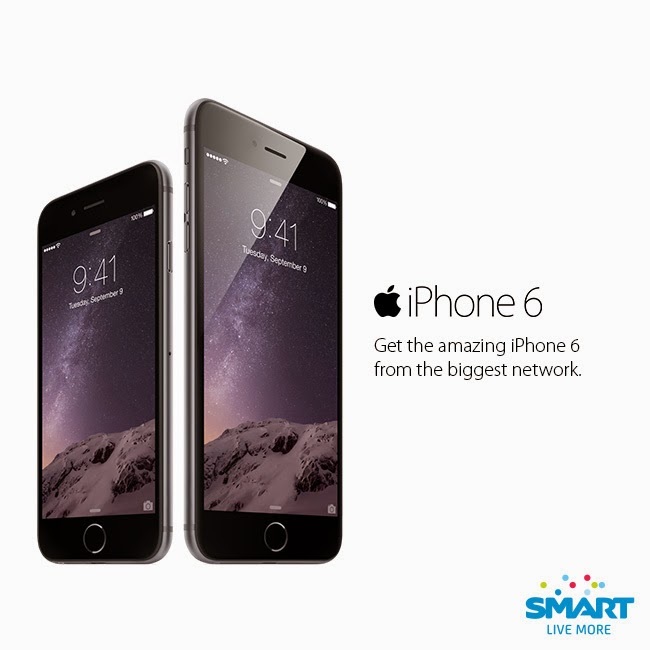 Customers can sign up starting today at www.smart.com.ph/iPhone. For more information please visit www.smart.com.ph. For more information on iPhone, please visit: www.apple.com/iphone.